service. What I didn’t mention is that on one of our deliveries, I received a couple of additional items accidentally. Yorkshire puddings and a Banoffee pie. Two rather very British items that I may not have ordered for myself but were items I kept anyway to try. 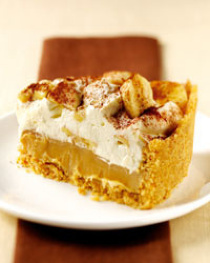 A Banoffee pie is a British dessert made from bananas, cream and toffee on a crust made from biscuits and butter. The toffee, also oddly enough, is made from condensed milk, by boiling an unopened can for 3-5 hours. Kind of like a graham cracker crust with a layer of toffee, sliced bananas, a layer of whipped cream and then some shaved chocolate on top. It is claimed to be invented in 1972 in a restaurant in East Sussex. Anyway, I pulled it out of the fridge and had a slice. It was a slice of heaven. The buttery crust balanced well against the sweetness of the toffee. The banana slices survived freezing and held their texture. And the whipped cream layer wasn’t too too sweet (although Mark might argue this point). I really enjoyed this pie. I didn’t over indulge in any one sitting, just savoring a reasonably sized slice after dinner. This went on for a few days where I would come home from work, enjoy our dinner and then partake of the creamy yumminess later in the evening. Admittedly, I had been nibbling on this pie for five days now. But I was really looking forward to a piece of Banoffee pie! Mark had *just* thrown it away. It was sitting right on top in the garbage can. It was probably even still cold. Posted by deb on Wednesday, January 16th, 2008, at 7:50 pm, and filed under Expat Observations. Hi there. Next you’ll be telling us that you tried Christmas pud!